It makes sometimes sense to sort pictures by image resolution, for instance to create a set of desktop backgrounds that fit the monitor resolution exactly. Sure, it is possible to pick photos and images manually, but that can take quite some time. Dimensions 2 Folders is a portable software for Windows that can sort all, or only selected, images of a source folder based on their resolution or aspect ratio. Two settings of the program are mandatory, the others optional. The mandatory steps are the selection of a source and destination folder. This alone would be sufficient to use the image sorter, which can be started with a click on the go button. The options on the other hand offer a great deal of customization. It is for instance possible to move the files instead of copying them to avoid duplicates on the system. 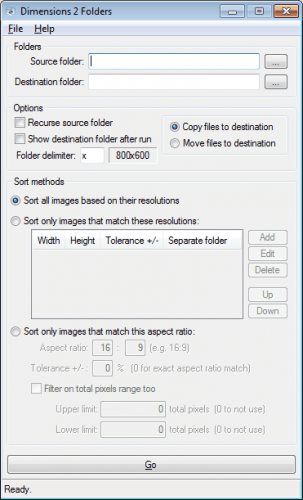 The sort method can be defined to only sort images that match specific resolutions, excellent for creating a new folder with images in one, or multiple, specific resolutions. Another sort method is to sort only images that match a specific aspect ratio, including the option to define a tolerance percentage. It is furthermore possible to recurse the source folder, open the destination folder after the sorting operation completes, or to specify the folder delimiter. Dimensions 2 Folders is an excellent program for resolution or aspect ratio based picture sorting. It is for instance ideal to create a wallpaper collection, or find images of a specific size for an image gallery, presentation or development project. The software is available for download at the developer's website, should work in most Windows versions and editions, tested on Windows 7 Pro 64-bit. Update: The latest versions of the program add some interesting options to it. You can now cancel scans, useful if a scan takes way to long to complete, and setting changes that you make are now saved so that you can reuse them when you start the program the next time. This also works great under Linux using WINE. Thanks for the confirmation Shawn.